How many bedpans is too many? 10? 50? Try 250. That’s about how many bedpans and items of bedpan memorabilia Eric Eakin has collected thus far. “I have bedpan greeting cards, bedpan poems, bedpan jewelry, and bedpan salt-and-pepper shakers,” he says. Eakin’s also got plenty of vintage and antique bedpans, each one clean enough to eat out of, should you be so inclined. 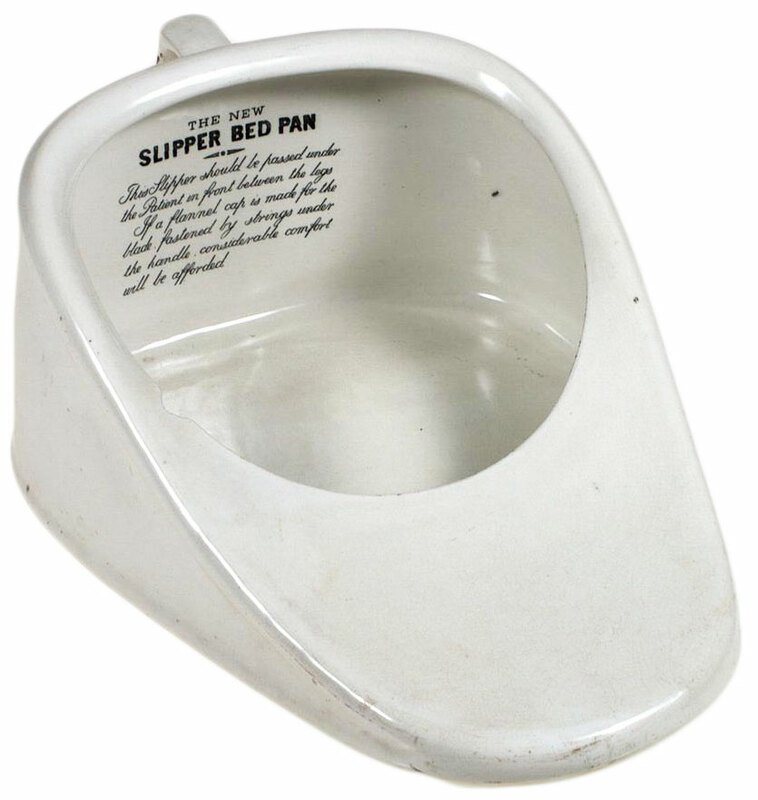 A vintage Boots “Slipper” bedpan, like the one Eakin’s mother received as a gift. Eakin realizes it’s hard not to joke about his particular niche of collectibles, even though he takes them quite seriously—until an unfortunate computer crash, he maintained a lengthy document with notes on each of his treasured artifacts. Someday, he hopes his collection might be on view at a medical school or history museum. But for now, to the amusement of friends and neighbors, the bedpans live in the Eakin family basement. We recently chatted with Eakin about his very unusual collection. Top: A common Jones Relax model, circa 1930s. (Via the VCU Libraries.) 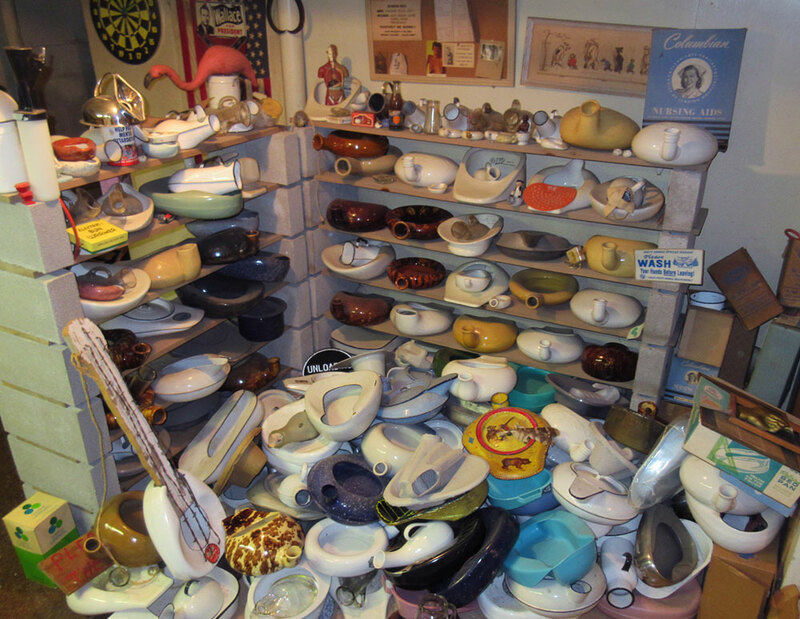 Above: The bulk of Eakin’s bedpan collection. Collectors Weekly: Where did you find all these bedpans? 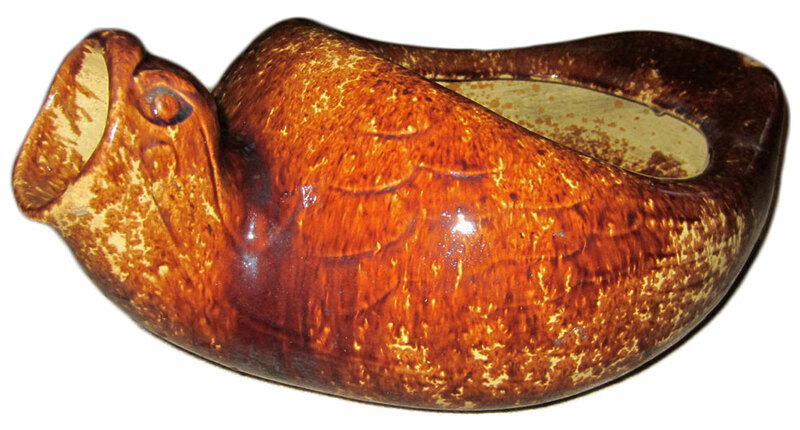 The contents of this bird-shaped bedpan would be emptied out of the animal’s mouth. For years, my wife and I would go to antique stores, and while she was looking at jewelry and paintings, I was looking for bedpans, but they’re almost never displayed. They’re usually down on the floor or underneath a table, so I’m always looking down while she’s looking up. I started with both bedpans and chamber pots, but on a trip to Toronto, I discovered that chamber pots were a legitimate collectible with prices to match. So I abandoned them and went strictly for bedpans. Now, 20-some years later, I have close to 250 items in my collection. 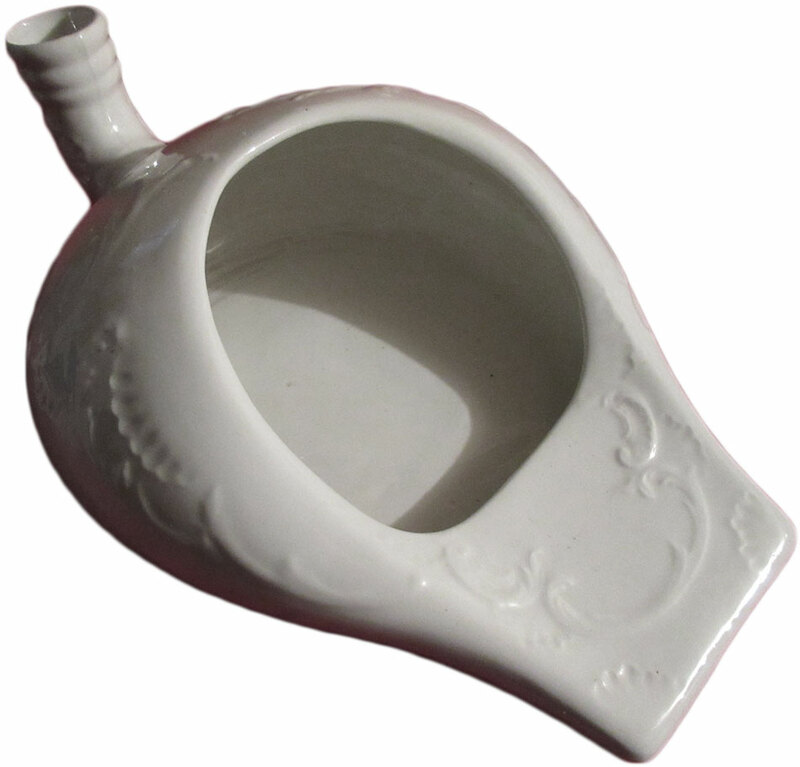 Collectors Weekly: What’s the difference between a bedpan and a chamber pot? Eakin: Well, they’re distinctly different in size and function. Indoor plumbing only arrived in the early 20th century for most people. Before that time, if you got up in the middle of the night and had to use the toilet, you’d go in a little pot. It was usually the youngest child’s responsibility to empty all the chamber pots in the morning. Chamber pots are about 10 inches around, often with ceramic handles, and have a lid on them. A friend of mine said he once sat down to dinner with some friends, and they were eating on fancy china. But then, they brought out the soup and served it from a chamber pot, and he didn’t have the nerve to tell them what they were eating out of. They thought it was a beautiful antique soup dish. A bedpan, on the other hand, is for people who are infirm—people who are unable to move but still must move their bowels. Someone with a broken leg or who’s immobilized for whatever reason, their system still functions and must evacuate, and that’s how bedpans came into use. Collectors Weekly: Does it bother you that most of them held bodily fluids? Eakin: No, the first thing I do when I get them is thoroughly clean them. They’re all grouped into one area of our house, and there’s no smell. They were meant to be cleaned and reused. Porcelain cleans well; metal cleans well. 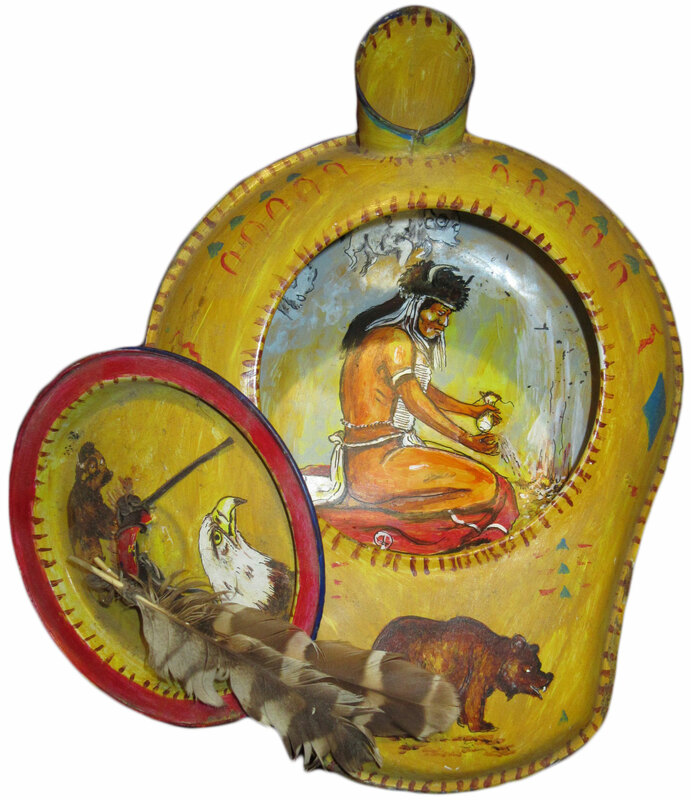 Some of Eakin’s bedpans are truly folk art, like this bedpan and lid meticulously decorated with Native American imagery. Ceramic was eventually replaced by metal. The enameled Jones Relax model (see first image), made by Jones Manufacturing Co. in West Lafayette, Ohio, really set the standard, and the size and shape generally hasn’t changed much since the ’40s. But there are a thousand different ways you can enamel metal: You could put trim on them, you could put sparkle on them, you could spray them with different colors like Jackson Pollock. Generally, porcelain bedpans didn’t have lids, which would make them unpleasant until emptied. The newer enameled ones came with lids that made it easier to transport them and dispose of their contents. Collectors Weekly: Have you met any other bedpan collectors? Eakin: EBay has obviously changed the nature of antiquing. For many years, I was usually bidding against someone else, and eventually, I found out she was a nurse in Alaska. Now, I’m pretty much the only player out there, I think. Somebody once sent me a newspaper article about a collector named Earl Lord from Eau Claire, Wisconsin, and he had around 225 bedpans. I looked Earl up and talked with him at length. He had a cottage up in the woods, and his friends visited thought it was funny he had a bedpan there, so every time they’d come to spend time with him, they’d bring another bedpan. Earl Lord, the Bedpan King. We exchanged Christmas cards for a number of years, then he dropped off the map. I tried to contact his widow, but I wasn’t able to reach her, so I don’t know what happened to Earl’s collection. Eakin’s collection also includes less-inviting devices like a rustic tin urinal (left) and a disposable bedpan made from recycled newspaper (right). I also proofread the Kovels’ Annual Antiques and Collectibles Price Guide because they’re based here in Cleveland, Ohio, and they once wrote a column on my collection. I got a number of responses from people overseas, including a call from a guy in Israel. He was born somehow deformed and couldn’t move his legs, and was abandoned as an infant at an orphanage run by nuns. The nuns didn’t give him much of a chance to live and would place him under an open window at night, hoping he would succumb to the elements. But he didn’t: He kept living and fighting, and his earliest tactile remembrance was of a bedpan. He had collected about 80 or 90 of them when we talked, and we exchanged bedpans. I sent him a couple of common American ones, like the Jones Relax, and he sent me a couple from Israel. In addition to Dee’s “Half-Pint” urinal for boys, Eakin has Dee’s “Puddles” urinal for girls. Collectors Weekly: What are some of the more unique bedpans you own? Eakin: I have a urinal from a B-52 bomber. Since these guys were on long missions, flying for hours and hours, they had to go somewhere. I also have novelty items, like a little box that says “electric bun warmer.” You open it up, and there’s a little ceramic bedpan with a phony electric cord attached to it. 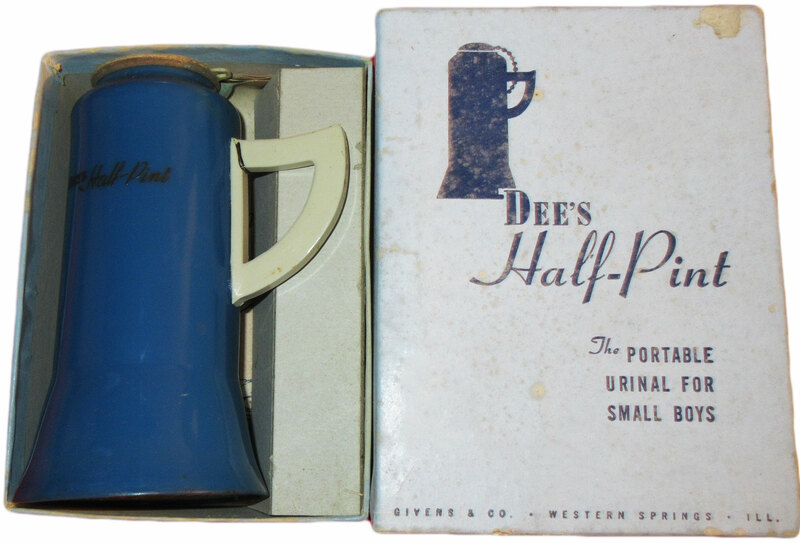 Tommee Tippee, the company that made self-righting cups for toddlers, also made a line of travel urinals for boys and girls back in the ’40s and ’50s, and I have some of those. As a Clevelander, one of the objects I’m most proud of is a urinal screen with Art Modell’s face on it. Art Modell owned the Browns, and when they moved to Baltimore in 1999, they hung an Art Modell effigy outside the stadium. It was brutal. We were down there for the last Cleveland Browns game, just walking around in the crowd, and there was a guy selling urinal screens with Art Modell’s face on them. I have a bedpan signed by all the girls on the soccer team I coached, which they gave me for my birthday. I have a miniature bedpan novelty item with a little Richard Nixon head inside. I have bedpans that are really tiny, not even a half an inch long. If you were going to make a diorama of a hospital room, you’d need miniature hospital equipment. Hence, they made these tiny plastic male and female urinals. 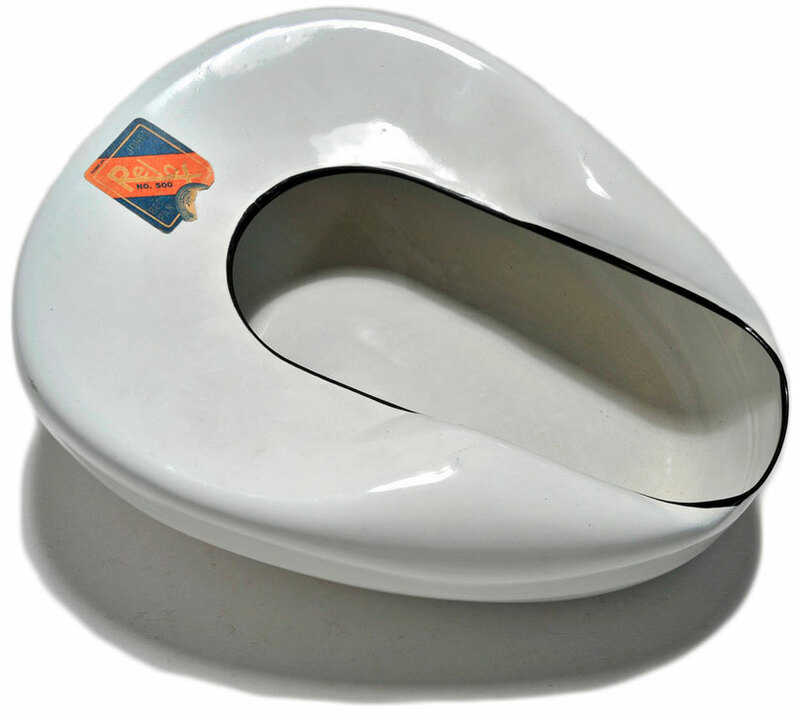 Collectors Weekly: What’s the story behind the James Traficant bedpan? Eakin: Traficant was the Sheriff of Mahoning County, Ohio, a real gritty, steel-mill type of place. That area around eastern Ohio and western Pennsylvania was a very gnarly part of the country, with a lot of gambling, hookers, and cops on the take. Traficant went on to become a congressman, and then he was convicted of 10 different counts of bribery and extortion. They finally sent him to prison, and that’s when this bedpan was made. The artist was a Youngstown-area guy who would paint on plastic bedpans and my daughter, Marah, found this one a few years ago. It has puffy paint and glitter all over, and decoupaged pictures of Traficant. On the back, it says, “This bedpan is dedicated to James Traficant, the meanest mother that ever walked the Mahoning Valley,” or something like that. And it’s dated and signed by the artist. 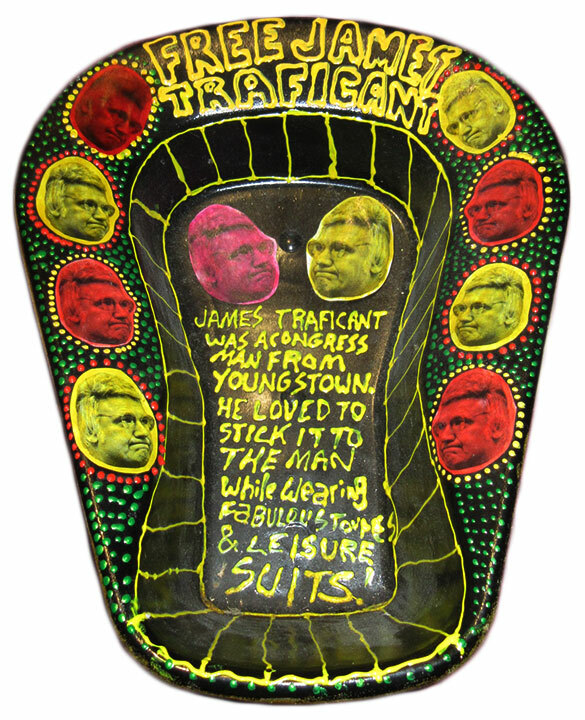 A local artist created this bedpan art dedicated to James Traficant, a former politician who went to prison for bribery and extortion. Collectors Weekly: What’s the typical reaction when guests see your collection for the first time? Eakin: It’s either “Ooh!” or “Aah!”—either yes or no. There’s no gray area, and a lot of people just don’t get it. I always tell people you have to see my collection in person to really get it. When you tell someone you collect bedpans, they think you’re into coprophagy or some other disturbing thing, but that’s not what it’s about. It’s about antiques, and history, and saving things that other people don’t care about. My wife and I are very involved in our local historical society, working in a museum that dates from 1818. It’s full of priceless objects. And every day that we go in there, we realize we are standing on the shoulders of hundreds of people who saved this stuff for us, and it’s our responsibility to save it for the people of the future. It’s the same for any type of collector. Now, I have no idea what I’m going to do with all these bedpans. My daughter says she’s heiress to the world’s largest bedpan collection. Well, I’m not giving them to her—she lives in a one-bedroom apartment in Chicago. She doesn’t have room for 250 bedpans and related objects. The Case Western Reserve Medical School in Cleveland has a great museum called the Dittrick Medical History Center. If I am hit by a bus tomorrow, the wisest thing would probably be to donate it to them, though whether they’d take it or not, I don’t know. But at this point, I’m still in the acquisition phase. Left, Eakin paid $85 dollars for this bedpan from the early 1800s made with a tiger’s-eye glaze. Right, a blue granite-ware bedpan with a fitted lid. Collectors Weekly: What’s the most you’ve spent on a single bedpan? Eakin: Eighty-five dollars. I was at an antique show near Philadelphia and spotted this bedpan with a tiger’s-eye glaze, probably dating from the early 1800s. But the most treasured item in my collection is a newspaper article from Rochester, New York, about a woman who collected roughly 150 bedpans. She sold her collection to the Guinness Book of World Records for $150,000, and they mounted it on a wall. Essentially, they drilled screws into all of her bedpans, wrecking every one of them. So I figure my collection’s worth a lot of money now, and you know why? I got in at the bottom. In the 1990s, Eric’s bedpan hobby got the whole Eakin family onto MTV News Unfiltered. I have some bedpans that my mother had. I don’t want them. I don’t want to throw them away. Do you know anyone that would want them. I have a bedpan not quite identical to the one your mother was given, The New SLIPPER BED PAN.Underneath the instructions is stated ‘The Best English Ironstone.’.Could you please tell me if this is worth anything,or should I plant my new season perennials in it ?.thanking you in anticipation. Seems to me we have a journey together, but mine isn’t exactlly like your. I have a second hand store in Idaho, and I just inherited one, she (Aunt) left it to me with about $300 worth of $2.00 bills in it. So now I have been on a quest to seek any value in that old handpainted bedpan my aunt left me, ha ha. Plus my Dad gave me another chore to find out something about this barrel porta john he just dropped off. It has all metal handles/ hardware, but no seat, no info on, in at all. Question have you in your travels seen a barrel porta pot? let me know, if you please. I have just purchased what I think might be bedpans! They are both of a goose – the neck is a handle with the head moulded onto its back (as though it was going to put its head under a wing)…there is an ‘aperture’ in the neck so it looks a bit like a jug…but it does look like a urinal/bed pan. They are made of stoneware and decorated…they look very alike in shape but there are some slight differences! Does anyone know a pottery that made these? Mine have spent sometime outside and have some chips to their bases. I can’t find anything like them…but…I’m pretty sure that this was their function! Have you ever seen one like it? As my mother has gotten older she has begun going through her things and giving the antiques and collectables to me. This past weekend I was the recipient of a very old Willets bedpan. It is the tapered bowl type with a spout. I found this article while doing research. I love my bedpan and enjoyed reading about Eric Eakin’s collection. I have a painted bedpan hanging in my bathroom; my porcelain baby bathtub with flowers planted yearly in my front yard and upstairs the chamber pot we took on vacation when I was a child. Collecting bed pans in all shapes sizes n colors…..now I’ve heard everything! ! I have a yellow porcelain bedpan from my grandmother who died in 1954. I’m quite sure it is somewhat over 120 years. I would like to sell it. I have no idea what it is worth. Ihave a ceramic bedstone, a jar that i to be filled with hot water, i cant find info about these, or if its worth anything. Tips? Hi, I am a retired nurse and have been obsessed with ALL things medical, and have approximately 25 porcelin/ironstone bedpans that I wish to sell. I currently live in Katy, Texas, and am moving back to Nebraska to be near my daughter. My collection is too large to pack ( and heavy ) and no room to keep as I will have to downsize. I need advice as to how I can sell or otherwise dispose of them! I could send you pictures it you are interested. Thanks for your time, Betty H.
I have a glass (what looks like a man’s) urinal and was looking for some history. I saw only one other on line with little info. I have a S. Maw Son & Sons White Procelain Round Bed Pan and Urinal. It is in very good condition. Please can you try to give me a date it was made and a guide price of what it’s worth. Just like to find out more before we sell it. I love your collection. I have been a RN for 37yrs. and I just think this is awesome. Hello, I have found an old ironstone bedpan( I think that’s what it’s made of) . I have posted it on a FB site. It has 2 small hole in the flat part of it on the bottom. No one can answer why they are there. Makes some of them say it’s a planter. I found it in the dirt basement of an old house I’m sorting through. Please tell me what they’re for. Thank ou. perfect fruit bowls just await until the bowl becomes less full and watch your guests realisation …. Hi! Are you still looking for bed pans? I have one from the 40s. Thank you! “ ” Under the hierarchy of the gay umbrella, hair fairies were bad, flaming queens were horrible, and transgender women were the worst.